Paced Julia through a workout - 2 miles in a fartlek on the hilly ward course, then 1 more mile down on that same course. Paced Stephen on that same course - he got 15:35.9 in spite of the fall at the end. Very even splits, nothing slower than 2:04 which was on the worst part of the course. Then finished the run with Joseph, Jacob, and William - they did their usual 0.25 pickups at the end, except this time Joseph and Jacob joined William for his. Then ran that same course myself. It was tough - I think the 20 mile run on Saturday + fast Sunday gave me a good glycogen dump. I barely broke 12:00. Jenny did 6, I think, with a tempo pickup at the end. Pace Julia through a 2 mile fartlek on the hills. Paced Julia for a mostly downhill mile. Paced Stephen with Joseph, Jacob, and William helping. With William, Joseph, and Jacob - 0.25 pickup at the end. With Joseph and Jacob, 0.25 fast at the end. 2 mile tempo on the ward course - hills. Paced Sarah through her 2 mile tempo in 16:05, then ran back and ran that same course myself in 11:01. Sarah lost a few seconds on trying to avoid a collision with a biker. Usual distances for the kids. I felt sluggish at the start of my tempo, but was able to find a rhythm. Much better than yesterday. Paced Sarah through 2 miles down the canyon. Back on the same stretch - easy pace. Tempo down the same stretch. Cool-down back to the car. Usual runs with the kids with pickups for 0.25 with Joseph, Jacob, William, and Julia. Usual runs for everybody. Did 0.5 pickup uphill at the end in 2:53. With William - 0.25 pickup. Met Julia and ran a fast 0.25 with her. With Joseph and Jacob - fast 0.25 at the end. Alone - pickup for 0.5 uphill. With Matthew at the park. Drove with Jenny to the airport early in the morning and picked up Polina Carlson. Hyrum asked us if she could stay with us for the UVM Half. She will be here until Tuesday. Usual runs, usual distances for the kids, easy pace. With William and Stephen - I think. Do not remember - I think this was with William. On the positive side of things, the winners got cool USATF Champion shirts. Paced Sarah through a 2 mile tempo down the canyon. Timed Jenny and Julia - 3000. Timed Joseph and Jacob - 3000. Utah Valley Half, 1:15:04, 11th overall, really 3rd master, but got 2nd master award because Scott Keate finished 5th overall - $100. Another race "out of a hat" this year. Apparently my little tweaks - sweet potatoes for lunch, almost daily 2 mile tempos, and additional jogging after Matthew's runs have done me some good. This is a course PR for me (though I should add that when I was younger I was running the full and split faster in the first half - though never in the second), and almost master's PR - missed it by 22 seconds. Well, I do not count my 1:08:59 at Big Cottonwood Half as a PR of any kind. I think 2000 feet of elevation drop for the half - even at altitude - falls under the Russian saying С горы и свинья рысак - "A pig can go as fast as a race horse on a downhill". My original plan was to run with Polina for some time and then see what happens. She told me she wanted to attack the course record of 1:13:32. 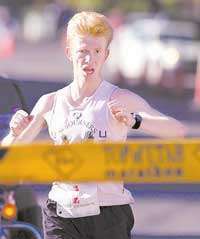 The plan was clearly ambitious as she had never raced at altitude before, but it was not impossible given that her half PR was 1:13:35 in Fontana (aided course), though it does fall into the Big Cottonwood category, however she had 1:14:49 in Virginia Beach (record-eligible course) to her credit as well. So I looked at the splits Benjamin and I had when I paced him 4 years ago, adjusted them a bit, and came up with a schedule that would give her a chance for the record if she had a strong finish (5:30 pace for the last few miles). We hit the first two miles right on the dot in 5:35/5:36. Then the altitude got to her, and did so big time. But in spite of the trouble, she survived enough to finish second in 1:18:51. She got passed by Samantha Diaz from Wyoming at around mile 9 who ended up with 1:17:00 barely missing the $250 bonus due to not being right at the starting line when the gun went off. I asked Polina afterwards if she regretted not just pacing for the win + sub-1:17:00 bonus, she said no. Come to think of it, if 5:35 pace early on caused that much trouble, perhaps Samantha's 5:30 pace towards the end would have done a similar amount of damage, so perhaps the end result would have been the same. Or maybe not, we will never know. At that point, both Polina and I were drafting behind Glynn Handley. The pace felt aggressive to me, so I considered falling back and staying with Polina, but decided to take the risk and go with Glynn. The risk ended up being the right decision, as Glynn paced me perfectly to the best time I had in me today. I felt better than expected on the uphill in the third mile, but it was not good enough to keep up with Glynn. He put a gap of around maybe 5-10 seconds on me. When we crested the hill I had an interesting experience. I prayed to know what to do, and I felt a prompting - do what it takes to catch him, then you will be able to stay with him for a while. I doubted at first - the pace was aggressive to begin with, both in terms of numbers relative to my training and how I felt. I got dropped. Now I need to close the gap. If I do, I would have to run all out and be ready to be done when I catch up. But in absence of anything else, when we got to the steep downhill I hit the gas pedal. I know I can be aggressive on steep downhills and get away with it. Amazingly Glynn started coming back to me, and by about 4 miles or shortly after I miraculously regained the contact. After that I ran with Glynn all the way until he dropped me at the last mile. Colin Gill caught up to us around 11, ran with us, and then made a decisive move closing in something like 5:20. What was he doing in the back anyway? We caught Jacob Kuntz around 12, I was able to drop him with about 0.5 to go after Glynn and Colin had dropped me, but then he started his kick and passed me back. Joseph and Jacob went 1-2, William faced some unusually tough competition and his time got him last place out of 7, Stephen was 2nd out of 2, first place was 3:13. To the house from the finish. With Matthew, Sarah, and the gang of boys to the park. Back from the park with the same gang.